We’re excited to announce that Duck Duck Moose, an award-winning developer of educational apps for young children, is now part of Khan Academy. We believe every child should have access to the best learning resources, so we’re making all 21 of Duck Duck Moose’s apps free. Early childhood learning is a natural next step for Khan Academy. It allows us to reach children at a younger age and begin to have an earlier impact on basic literacy and math skills. We’re thrilled to enter early childhood learning with Duck Duck Moose as our partner. We’ve long admired their whimsical children’s apps, which have been downloaded more than ten million times and receive rave reviews. In addition, Duck Duck Moose’s nine-person team is joining Khan Academy to lead a new initiative to develop early learning products for young children. This is possible thanks to philanthropic investment firm Omidyar Network, the first underwriter of this new initiative. Like us, Omidyar Network believes early childhood education is critical for long-term success. Together we hope to have a lasting impact on the lives of children. 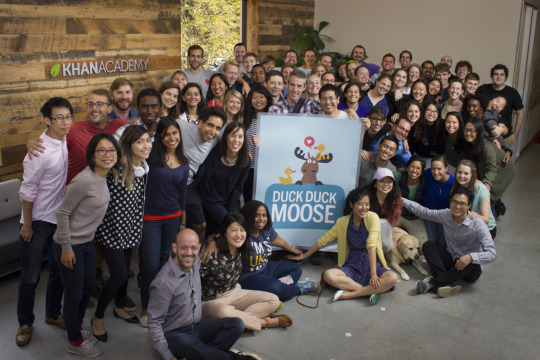 We’re thrilled to welcome Duck Duck Moose to the Khan Academy family, and we hope you love their apps as much as we do. P.S. Make a donation today to help us with our mission to provide a free, world-class education for anyone, anywhere.